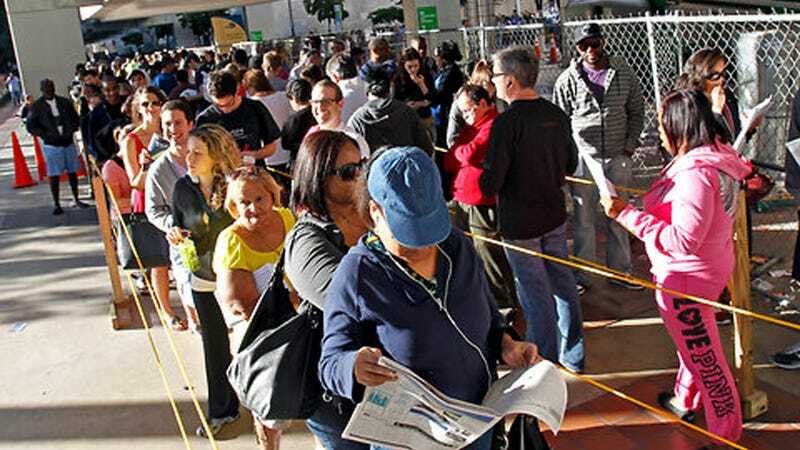 There are people in Florida who are waiting in football field length lines, some for up to eight hours, to exercise their right to vote as their own Governor fights to silence them. Aint that America? It's possible to trace the delays back to Republican Governor Rick Scott's decision to reduce the number of early-voting days from 14 to eight. Note that he shrank the window after 2008, when Democrats held a significant early-voting advantage. Mr. Scott had several opportunities to prevent this weekend's fiasco. On Thursday, in response to long lines and record turnouts statewide, the Florida Democratic Party and the League of Women Voters asked Mr. Scott to extend weekend early-voting hours preemptively. But he refused. The Times reported that "the governor and state election officials turned down the request, saying that the process was running smoothly." For a lot of people, last Saturday was the only voting day they had, and for the many still waiting in lines, other obligations may force them to leave without casting their ballot. Most people just can't afford to block out their entire day to vote. It's heartbreaking that there are people leaving because they just can't afford to be wait any longer. Heartbreaking and unacceptable. Here in California, I walk four blocks to my voting station, where i'll stroll right in, cast my ballot, and be done in ten minutes. Voting is easy, exciting, possible. If I was faced with the same barriers as Floridians, I don't know if I'd still be able to — after all, I have two jobs, a family, and old dogs who have to go outside every four hours or my carpets become the world's most expensive training pads. Sure, you can argue about the other ways to vote, but there's something fundamentally flawed about a system that makes things so difficult. On Sunday, Former Florida Gov. Charlie Crist (R) called Scott out about his refusal to extend early voting, even though it was clear that more was needed. "The only thing that makes any sense as to why this is happening and being done is voter suppression," Crist said in an interview with The Huffington Post on Sunday. "That's unconscionable. I think it's just the wrong thing to do. And the right thing to do would be to sign an executive order to make sure this doesn't happen and you expand the hours." Crist continues, "I did it because the disaster that was happening was that people weren't being able to exercise this precious right that is the foundation of our democracy. That's a disaster," he said. "When you have people waiting in line for four or five or even more hours — and a lot of them are senior citizens like they are in the state of Florida — that's a disaster. And it's wrong. And it's indefensible."